How Do Compression Stockings Actually Work? Without any subtlety the name compression stockings tells us that the key “ingredient” here is compression, and to be precise the type of compression must be gradient or graduated compression. Compression hose, stockings or socks apply pressure or compression to the legs in different areas and they do it “gradually” and with varying degrees of pressure. 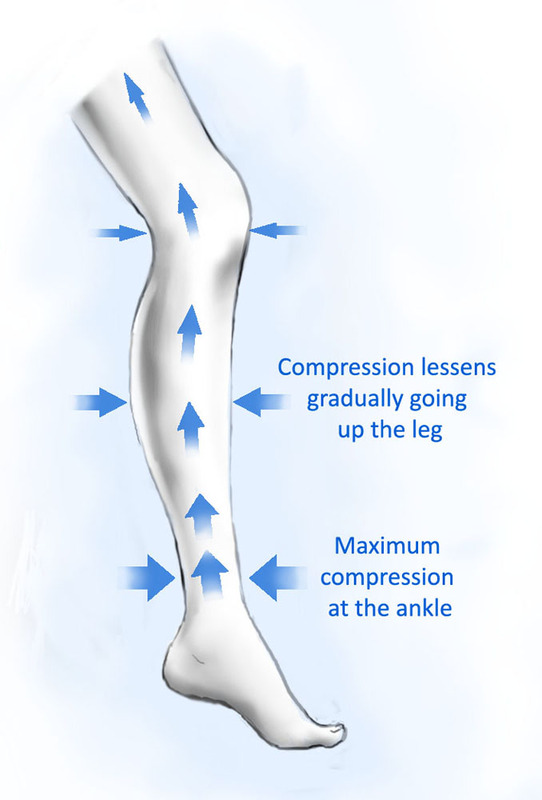 The most important part of graduated compression is that it must be applied with the highest pressure starting at the ankle area. From there the pressure must become less and less as the socks, stockings or pantyhose progress further up the leg. In the case of compression socks the pressure is the lowest just below the bend of the knee and with thigh-high stockings, pantyhose, tights and compression leggings the least amount of pressure is applied in the upper thigh area. 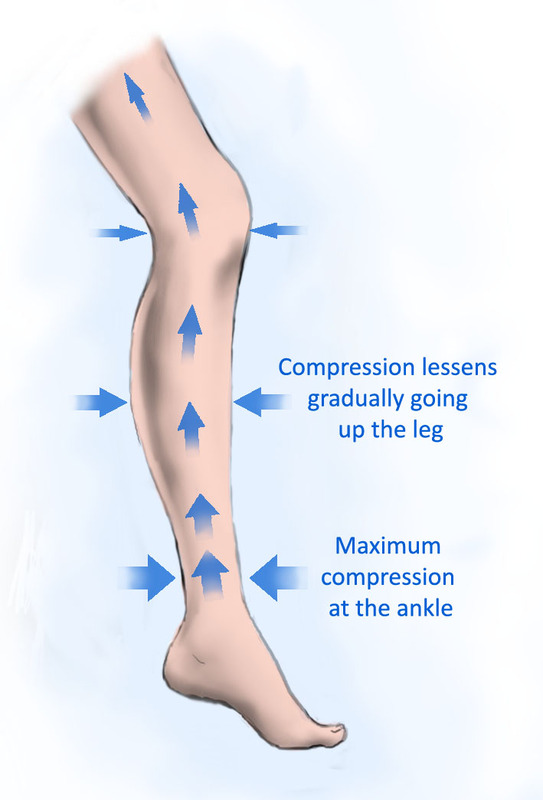 Compression can be preventative and/or corrective contingent on the situation of the individual using compression stockings. Depending on the type of discomfort or medical condition that needs to be addressed compression stockings are available in different compression classifications ranging from mild to moderate to firm and finally very firm compression. Preventative use of compression stockings would imply that there are no obvious physical signs and symptoms such as spider veins, mild varicose veins or achy, painful and fatigued feelings in the legs or only occasional and more or less intensely occurring leg issues. In such cases a healthcare provider might recommend graduated compression or support hosiery with mild compression probably in the range of 8-15 mmHg, which are available online or over the counter without prescription. Compression stockings have a long standing history. Over many decades they have gradually evolved from what could be depicted as an “ugly duckling” stage to becoming a beautiful “swan”. It was not until the dawn of the 21st Century that compression hosiery finally started to become more fashion oriented. Manufacturers have finally woken up to the fact that in order to make compression stockings more appealing to today’s fashion conscious consumers they have to remind their wearer of the sheerness, look and feel of fashion hosiery. In their defense it should be said that recent advances in elastic fibers and knitting technology obviously also played a part in the inauguration of fashionable compression hosiery. Many brands have succeeded in creating a range of compression stockings, pantyhose and even footless compression leggings and pantyhose one would be hard pressed to distinguish from high street fashion hosiery. Since their inception compression socks, stockings and pantyhose have also earned a solid reputation in the medical field as a non-invasive treatment for a variety of venous conditions in individuals spanning all age groups. Other applications for compression stockings also include work related leg issues in workers with standing or sitting occupations. Travelers are increasingly relying on so-called travel or flight socks with graduated compression to help prevent or reduce the risk of blood clots during long distance trips by plane, car bus, train or automobile. In recent years compression stockings or compression socks have gained an ever growing popularity in the athletic field where they have been praised for increasing stamina in professionals and amateur sports enthusiasts alike. In addition, compression stockings have been credited for shortening the recovery times after competitions and high energy training sessions by reducing muscle soreness and fatigue.